One of the things Pete Leithart is trying to do with his book, Defending Constantine: The Twilight of an Empire and the Dawn of Christendom, is to question Mennonite John Howard Yoder’s ideas on the “Constantinian Deal,” the arrangement between the church and the imperial state that Emperor Constantine is supposed to embody. Still, it was an empire, and there’s the rub. If it an empire, no matter how Christian the emperor might be, it is not good. So, at least, is the widespread opinion among Christian thinkers. Yoder and other theological critics of Constantine have three main criticisms of Constantine and Constantinianism with regard to his imperialism. First and foremost, Constantinianism simply is the identification of nation or empire with the purposes of God. By misidentifying the location of God’s action in history–which Christianity assigns to the church, but Constantinianism assigns to the price, the empire or the nation–Constantinians operate on the premise “the one nation or people of government can represent God’s cause in opposition to other peoples who, being evil, need to be brought into submission.” [Leithart is quoting Yoder.] This is ecclesiological and eschatological “heresy”–ecclesiological because the church gets absorbed into some worldly system, eschatological because the eschatological community, the church, gets absorbed into the realm of this world (empire) and because the eschatological order is dragged forward into the present age. 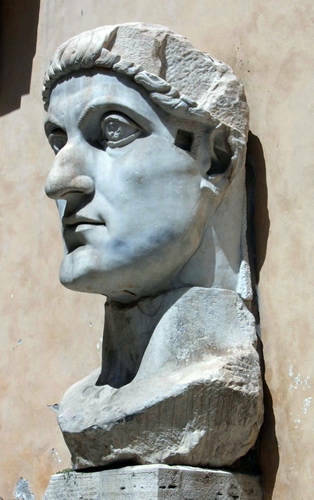 As a result of the collapse of the church’s independent identity and [merger] of Romanitas with Christianitas, the mission of the church was, after Constantine, profoundly distorted. This is especially an issue with Americans, who as a powerful people convinced of and obsessed with their virtue and giving their nation-state an almost religious significance (a key element of most Conservative American Christian churches is the belief that God has formed a covenant with the United States of America — a covenant for which there is absolutely no evidence whatsoever), are inclined to view their nation and its purposes as synonymous with that of God’s. The United States of America isn’t so much a a nation as it is a confessional church (our creed is the Declaration of Independence, the Constitution, and the Gettysburg Address)* with a flag and an army. It has been my experience that all God and Country “Christians” tend to put country first, as if God only exists to legitimize the actions of the state. Especially in the making of war and the enforcing of laws. Progressives are not immune to this. The whole notion of progressive politics is one in which the nation-state still comes first. The nation is the sanctified community of God in which the call for the poor is expressed, in which justice is to be realized, in which compassion shown. The United States of America is the entity to which God speaks when God demands justice and mercy. The nation, for progressives, is still a confessional church with a flag and an army. I cannot, and will not, speak to the nationalism of others for two very important reasons. First, Americans are uniquely powerful as a people and a nation, and thus are able to act upon our deluded fantasies of self-righteousness in ways others are not. I do not know how the people of Uruguay would act if they were powerful, but they aren’t, and so their nationalism is not so likely to beguile them or lead them into acts of mass destruction. Second, I’m an American, and the only nationalism I am compelled to support is that of my country. (Though some would insist I also support Israeli nationalism.) So it’s going to be the nationalism I will criticize most harshly. * Actually, there’s more to the American “creed” than that (Supreme Court rulings, for example, some speeches and essays), and the political dispute between “right” and “left” in this country is essentially a theological dispute over hermeneutics, how one reads, interprets and synthesizes ideals and promises about government from the credal documents. No, I don’t mind you cross posting these at all! Thank you for doing so!